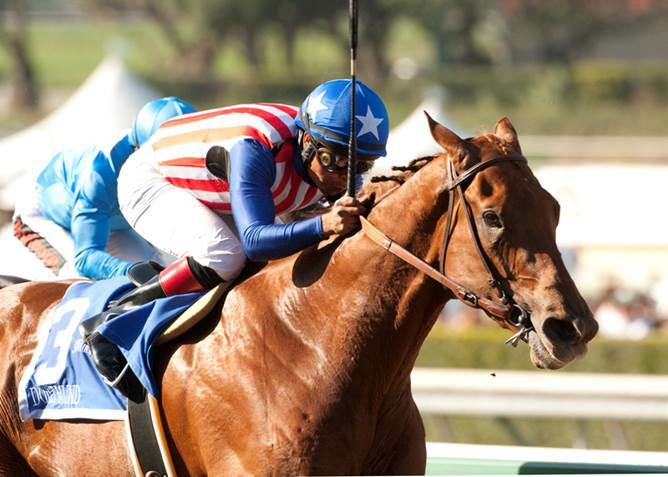 Dortmund and Martin Garcia take the San Felipe at Santa Anita. Benoit photo. Saturday saw Kentucky Derby Championship Series prep races coast to coast, with 85 points each available in races in New York, Florida, and California, and a Kentucky Oaks prep in Arkansas thrown in for good measure. Under the Kentucky Derby points system instituted in 2012, the 20 horses who earn the most points in a series of races designated by Churchill Downs qualify for the Kentucky Derby. In 2013, it took only 10 points to get into the Derby; in 2014, it took 20. With 50 points to the winner and 20 points to the runner-up in Saturday’s races, six horses had a chance to pretty much lock up their entries.